Most people are aware that Stonehenge is somehow aligned to the annual movements of the Sun. Each year thousands of pilgrims, druids and party-goers gather in celebration, hoping to witness the most famous of these – the Summer Solstice Sunrise on June 21st. At this time of year, as seen from the centre of the monument, the Sun rises in the same direction as the centre-line of the Avenue – the ancient processional approach to Stonehenge – towards the northeast. The Stonehenge Avenue alignment was first pointed out by William Stukeley in 1740. Even though almost everyone believes the Heel Stone was put up by the builders to exactly mark the summer solstice sunrise position, this can’t be true because it stands off to the right hand side of the alignment. Today the Sun seems to rise out of the top of the Heel Stone due to the modern trees that are on the horizon. Walking up the Avenue they would have seen the Sun setting exactly into the middle of the stones between the uprights of the tallest trilithon in the southwest. We can still experience this today, even though only one upright of that trilithon – Stone 56, the tallest stone on the site – remains in place. There’s a secondary alignment too – from Winter Solstice Sunrise to Summer Solstice Sunset. This was first described by Prof. Gordon Freeman in 1997 and it makes use of a “notch” in the edge of Stone 58 of the western trilithon to give a clear sightline across the stone circle. If they weren’t there, sunrise would be almost a Sun’s width to the left – and 4,500 years ago the Sun would have risen a whole degree further over to the left. Even though the Heel Stone wasn’t intended as the solstice sunrise marker, the sight is still magnificent – when the weather cooperates. Along the same alignment, but exactly in the opposite direction, lies the Winter Solstice Sunset point. … and Summer Solstice Sunset is seen over Fargo Wood to the northwest. What’s remarkable about these alignments through the circle is that they intersect over the centre of the Altar Stone (shown as Stone 80 in the plan below). The Altar Stone is not perpendicular to the main alignment but is offset so that it lies exactly along the secondary one. The intersection angle of 80° between summer and winter solstice sunrises at this latitude is echoed in the large gold lozenge discovered in 1808 when the Bronze Age “shamanic” burial from Bush Barrow, just south of Stonehenge, was excavated. Some see this as coincidence. Others believe the lozenge shows that the knowledge of this important astronomical angle was passed down the generations for at least 600 years. The lozenge and the other astonishing Bush Barrow finds are on display at Wiltshire Museum in Devizes. 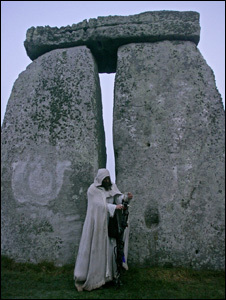 There are Stonehenge lunar alignments too, but that will be the subject of a different article.